I’m really just a guy who didn’t want to put up Christmas lights on my house. They have blown off for two consecutive years. The installers damage our gutters, shingles and often the lights themselves. I didn’t want to deal with the hassles again. But I didn’t want to be a complete Christmas looser either. I had planned to get some colored bulbs and pop them into my eve lights. But then I remembered that there were some cool wifi lightbulbs that changed color. A quick Google search later and I was pretty sure my adventure would start with a box of Philips Hue Lights. Installation info: Really straight forward. Plug your bridge (this links with your lights) into your router. Install the bulbs, make sure the power is on, download the Hue app. Link with your bridge. Search for the bulbs (app setup). Sometimes you need to enter in the bulb’s serial number for the Hue app to find it. Then start changing colors! After the novelty wears off you’ll want to set up some rooms and then you can link bulbs to those rooms. You can adjust bulbs individually or all together. You can also apply filters called ‘scenes” and set up your own color pattern and save it as a scene. Thermostat Confusion? I Have the (a) Solution! One thing I like about our home is that each level has its own thermostat and can be independently regulated (makes for more efficient cooling and heating and it actually cuts electrical costs). Thermostat technology has come a long way, however if your thermostat is in the wrong location it can cost you money and cause perpetual discomfort. Situation: Our upstairs thermostat is in the hallway. With no hallway air vents the temperature around that thermostat is mostly dictated by whatever makes its way up from the main floor. The old thermostat location was not ideal. Air from downstairs would heat and cool the hallway where the thermostat was located. When in use the downstairs fireplace caused a huge temperature discrepancy. Summer Situation: In summer the upstairs AC will run and run until the hallway cools to whatever temperature the thermostat has been set to. Since the air has to spill out of the bedrooms and into the hallway to reach the thermostat by that time all the bedrooms are too cold. Winter Situation; In winter the warm air from downstairs keeps the upstairs hallways warn as well. The net effect is that the bedrooms are left unheated if the thermostat is set to a normal heating range. If we compensate by making our heating threshold higher than normal the upstairs AC will run and run until the hallway warms to this temperature. Since the air has to spill out of the bedrooms and into the hallway to reach the thermostat by that time all the bedrooms are too warm. Solution: My wife pointed out that if we moved the thermostat into the bedroom that would solve all our problems. Since we use an automated system to control our temperature having it in our bedroom isn’t a big deal because others rarely need to adjust it. And thus was the thermostat moved. And there was there peace in the land. That was all a long-winded way of saying this: If you have a two story home and separate thermostats (main and upstairs) make sure your upstairs thermostat is placed correctly. One alternative option to relocating the thermostat is to use one with a remote sensor. Once again, I have decided to undertake a project for no particular reason- I just get enamored with an idea sometimes. In this case I was thinking about how much I like the noise of our fountain (probably because a friend just installed a very nice water feature in his yard) and how cool it would be to hear the sound of a fountain while sitting on our front porch. All of a sudden BOOM! I had to put in a front porch fountain. The first step was picking a location and that was easy since there was only one place to put a water feature. I wasn’t a huge fan of the bushes in front of our porch so I was happy to rip a few out to make room. The next step was finding something that would fit look nice and not be too loud. I remembered seeing some fountains at Costco last year so I looked on their website and came across a model called the LiquidArt Fountain Mountain Spring. I liked the shape, a pondless bubbler was just right and the price was pretty good (much less than buying it direct). I placed my order and it came within less than a week (shipping from Oregon via a freight company). As soon as it arrived I took actual measurements (it’s 2″ larger than advertised- a tight fit) and started digging. I naively assumed I could just shovel out a few wheelbarrow fulls of dirt and I’d be all set. Not quite. I think all told I ended up emptying five pretty big loads. I dug the hole a bit deeper than needed so I could lay down a couple inches of gravel. Deciding on a height was more difficult that I thought it would be. 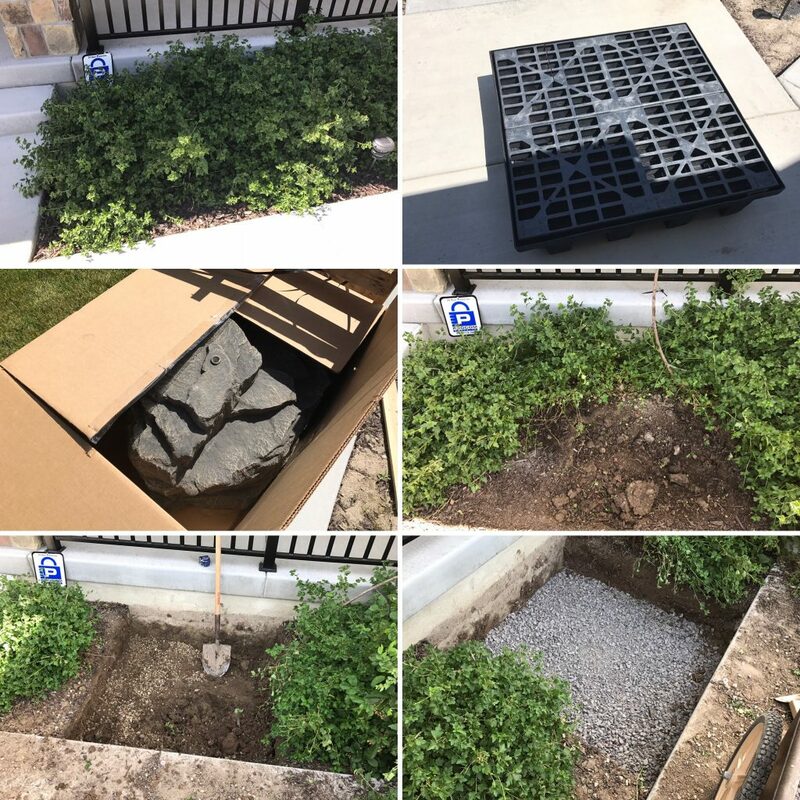 I ended up trying to seat the fountain two inches below the side walk to accommodate the rocks I was planning to get (I’m hoping the weight of the water and fountain won’t cause it to sink at all, but I’m mentally prepared to pull it out and readjust it if necessary). After getting the water reservoir installed and cleaned out* I placed the grid on top, placed the pump inside, ran the pump hose through the grill, overlaid the mesh and placed the “rock” (orienting it was tricky and I ended up changing it several times after seeing the actual water flow). Aside digging the hole that was the best part (sarcasm). *Quite a bit of dirt fell into the water reservoir. The only way I could think to get it out was to vacuum it up. I used this an an opportunity to acquire a new Shop Vac (quite happy with this model). Sweet! 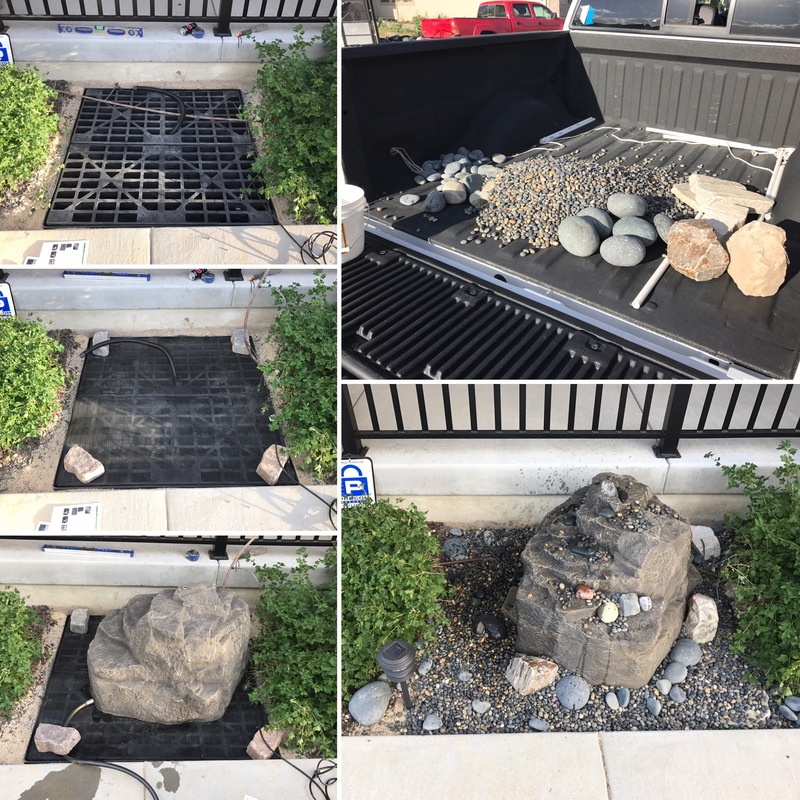 After the main fountain components were situated it was time to get some landscaping rocks. We live right by an American Stone so I headed over to see what they had. Turns out their selection is pretty massive (it was my first time there). Here’s how it works: You weigh in your vehicle and then go fill it up with rocks (keep track of what you get). Then you go a weigh in again and pay for your selection (according to your weight difference). They don’t really cater to jobs as small as mine but I managed to get what I needed. I’m not going to win any awards for landscaping / fountain design, but it turned out pretty nice (I wish I hadn’t pruned the bush on the left quite so much). Below is a quick video of the fountain running. I think it’s quite relaxing. In fact I would be on my porch right now if allergies weren’t ravaging my body. Overall: 8/10 – The LiquidArt kit is comprehensive, well designed and attractive. My only two gripes are minimal. 1) The PVC pipe that comes out of the top of the rock isn’t too attractive. I feel like that could have been flush with the surface. 2) Install wasn’t anything close to 3 hours, as described by the instructions. O Internet, Internet, wherefore art thou Internet? For some strange and unidentifiable reason there are areas in our home where the Internet simply doesn’t reach via Wi-Fi. The main floor office is one such example. Our primary router (a Nighthawk X6) is in the basement (in the mechanical room) and feeds the entire house and yard quite well. However, that particular network simply doesn’t function inside the office. I picked up a Night Hawk X8 router and set it up in the center of the office thinking it could feed the office and work it’s way out the main and upstairs floors. Not so! The X8’s newly created Wi-Fi network was limited almost exclusively to the office! Even though it was overkill, I left that situation alone for awhile because it got the job done and met our needs. But I knew one day that something would interrupt the status quo. All was well until I we needed Wi-Fi in the garage (for a computer and the Rainbird Sprinkler box). In hindsight I should have just run an ethernet cable to the garage when we built the house. But I hadn’t (maybe you still can!). There was still a way to potentially run an ethernet cable to the garage though.There’s a network jack in my bedroom which shares a common wall with the garage attic. I could set up a switch and then push a line into the attic and then down into the garage. Realistically it sounded like too much work. 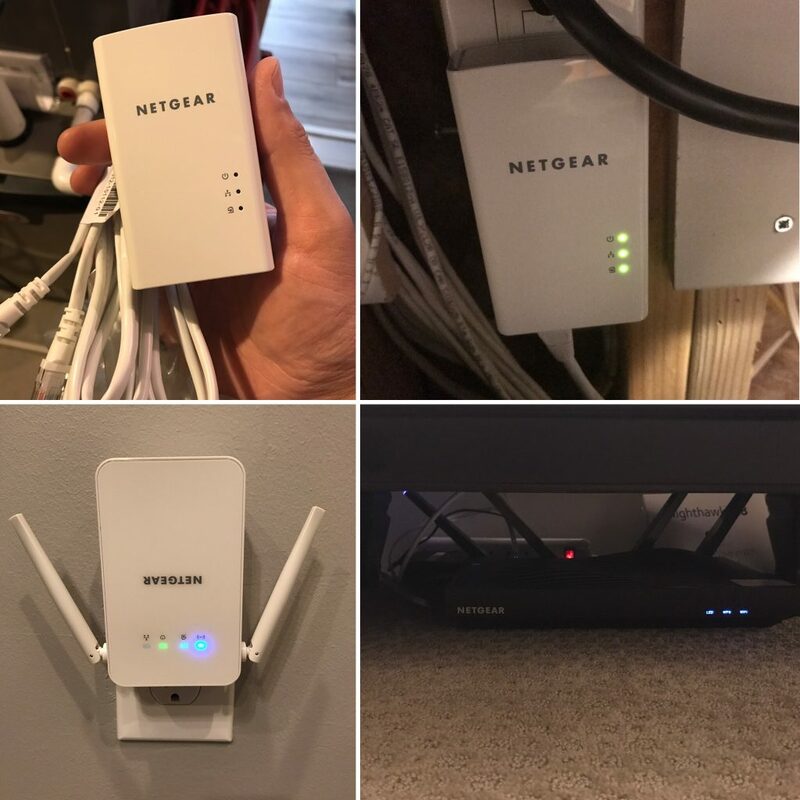 Here’s what I tried first: I picked up a NETGEAR – PowerLINE Wi-Fi 1000 Access Point and Adapter. I plugged one end into an outlet near my router and plugged a LAN cable from my Night Hawk X6 into the Netgear Access Point. I went out to the garage and plugged the receiving end into an outlet. Sure enough! They found each other and linked. However, the internet indicator was red, denoting a poor connection (I think it ended up being 3-4 mbps). Not great. I was lamenting my problem to a friend who suggested moving the Nighthawk X8 into my bedroom against the common bedroom/garage wall. Huh… that made a lot of sense. Sometimes you need another set of eyes om a problem. I started the process by moving the Net Gear 1000 into the office. If I repurposed the Night Hawk X8 then my office would need its router replaced. And what do you know? The 1000 linked up just fine from an office plug and after doing some testing I concluded that little Powerline 1000 could easily handle all the internet requirements of the office. Then I moved the NightHawk X8 upstairs. I connected it to the LAN jack behind my bed and stashed the Router beneath my nightstand for the time being. In this new location the Night Hawk X8 appears to serve the garage much better than anything else I’ve tried (and it also works throughout the upstairs and main floor, minus the office- something’s wrong with that office…). I’m ending up with with about 20mbps download speeds which are quite sufficient. And the signal level seems very strong, and this is, in some ways, just as important as the speed. I really think the relocated Wi-Fi network will be a huge help moving forward. Long story short: I solved the Wi-Fi internet dead zone in my garage by moving my Night Hawk X8 to a better location. I added a Powerline 1000 unit to the office to provide Wi-Fi there in the absence of the X8. This was a cost effective purchase and a great example of successfully relocating existing assets. At some point I need to set up the networks so they are, for all intents and purpose, one large mesh network. Anyone want to help me figure that out? Works well to create an additional Wifi hotspot. Claims gigabit speeds but it doesn’t seem particularly fast to me. Only broadcasts on 2.4 Ghz frequency (right?). I have been visiting with a friend who’s doing a major yard overhaul. One change he’s planning to make is to move his sprinkler system to a wireless setup so that watering can be controlled via a phone application. That sounded pretty good to me so I did some research to determine what I’d need to make a similar migration. It turns out that I didn’t need much! 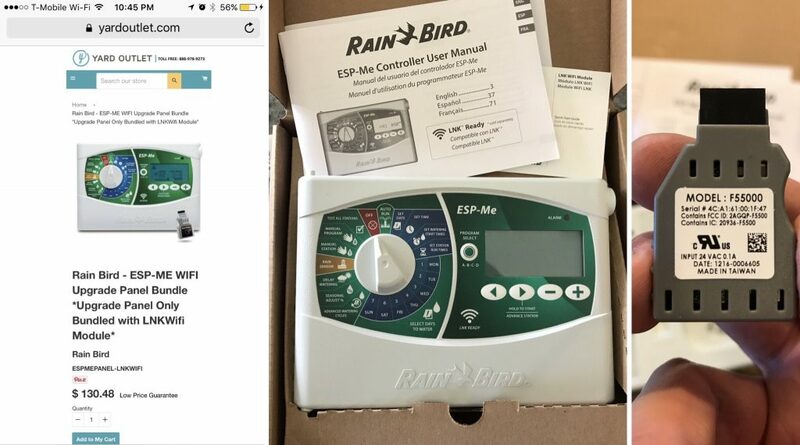 I have Rainbird ESP-Me controller that was installed a couple of years ago when we put in our yard. I noticed that Rainbird offered a wireless module for this controller, however my particular unit was not compatible, due to it’s age. At first I priced out a new controller with the wifi module, but eventually I discovered that I only needed a new control panel (not the actual box with the station controllers). A quick google search led me to YardOutlet.com. They offered a bundle package with the control panel and wifi module for about $130 with free shipping. They are located in Ogden Utah which seemed like a nice plus. I ordered Monday and, incredibly, I had my package on Tuesday. Whaaat? Everything came well packed and as advertised. Well done, Yard Outlet! Replacing the panel was incredibly simple. All you have to do is unplug the harness, pop off the old control panel, put on the new one and plug it back in (I think I spent about a minute doing this). I reprogrammed my sprinklers from the panel and then set about linking the sprinkler controller with the Rainbird App. Initially I had a little difficulty getting things to connect properly. I think part of that, in my case, was because the wifi in my garage is terrible (something I am working on fixing today). The Rainbird wifi module initially creates its own hotspot and then, from the app, you move the module to your home network. Obviously at that point your phone needs to switch networks too and mine hadn’t which is probably another reason I got the error below. After a few tries everything seemed to be working and I was ready to try out the app. After perusing the app my impressions are quite positive. It gives you all the same accessibility as the physical control panel. After you make adjustments you save them and the new program is written to your control box. Everything is fairly intuitive and you can even opt to have the app make watering adjustments based on the weather. The app control worked well on my wifi networks and via my cellular service (one thing to note- you can’t switch from a wifi network to LTE while you run the the Rainbird application- you have to close and restart the app for it to work properly). Below is a quick demonstration of starting and stopping the sprinklers via the Rainbird application (complete with a silly kid in the background). Being able to control the sprinkler zones from my phone will make it infinitely easier to do testing and make repairs. Overall, I think this is a very solid wifi sprinkler control set up, especially give how inexpensive it is. I’d give it my recommendation. BONUS 2: The RainBird app spends quite awhile getting the schedule and setting information when each connects to the sprinkler box. Originally I had thought this was because I had connected the unit to to a network with very low signal strength. I rearranged things and then connected the ESP-Me to a much better network. Sadly, the app’s load time was the same. I’m docking a half point for that. January was a blur. There’s no other way to describe it. I feel like we did a ton of stuff, but the photographic evidence doesn’t seem to support the claim. Maybe the best thing to do is just pretend it was a relaxing month. January was like a slow motion massage. What better way to start off the 2015 than with a little skiing? Fran, Catherine, Randall and the kids (most of them) hit Sundance for a day of snow and fun. One of these days I’m going to go skiing again. Green diamonds all the way. The beginning of the year is the perfect time to make poorly thought out resolutions. “Be healthy” Vague and yet impossibly difficult. Lots of veggies and lean meats? Check. Good thing these kind of resolutions only last a couple of weeks! Gabe is playing basketball again! We put in a quarter court (is that a thing?) in our side yard and he and Mike play all the time. I actually played a quick game against both of them. I am really out of shape, but I crushed them. Keep practicing kids! Per French tradition Francoise made “la galette des rois” (the cake of the kings). In addition to being delicious there is a hidden treasure in the cake. Whoever finds it while eating is the king! This year I was the lucky guy so I got to wear this sweet crown. How is this even possible? I swept up an amazing pile of trash. And then a few days later I swept up another pile. Our kids just seem to dump trash and food on the floor wherever they go. This isn’t “haha” funny to me either. I feel like it denotes a serious lack of respect and consideration. What can I do? I know… just keep sweeping. Even taking into account their messes I feel like I have wonderful kids. I spent some time with Gabe playing on the SNES and working on a few projects- he’s quite the little builder. Chloe is enrolled in dance class and loves it. Claire is turning into quite the little chef and can make cookies completely on her own. Mike is an adept strategist and it’s fun to play games like Pandemic with him. Yes, the rewards of parenthood often outstrip the costs. We’re working on landscaping! The HOA here in Ivory Ridge has been fantastic. They have completely ignored everything we have asked and our repeated submissions. 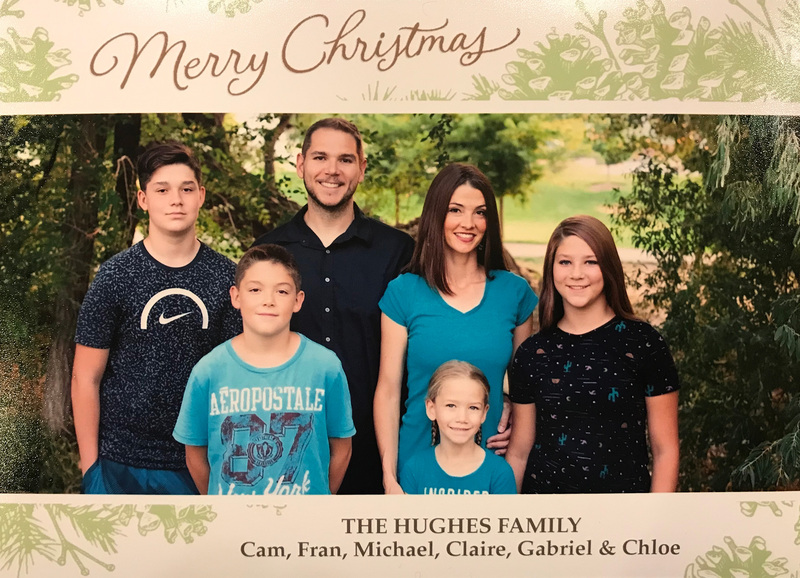 I don’t understand why the HOA hasn’t been turned over to the community or why no one who actually lives in Ivory Ridge is part of any decision making process. We are just plunging ahead. I don’t see why they wouldn’t approve our beautification efforts but nothing surprises me anymore. As I said, the visual documentation of what I experienced in January is lacking. Perhaps that’s due in part to being gone for a few days at the SHOT show. Perhaps I need to take more pictures. Or perhaps my brain just makes stuff up to hurt me.